This model runs in COR and OpenCell, and the units are consistent throughout. It is a faithful reproduction of the paper equations, and the output is similar (but not identical) to the published results (Fig 5). ABSTRACT: We propose a simple mathematical model of liver S-adenosylmethionine (AdoMet) metabolism. Analysis of the model has shown that AdoMet metabolism can operate under two different modes. The first, with low metabolic rate and low AdoMet concentration, serves predominantly to supply the cell with AdoMet, the substrate for various cellular methylation reactions. The second, with high metabolic rate and high AdoMet concentration, provides an avenue for cleavage of excess methionine and can serve as a source of cysteine when its increased synthesis is necessary. The switch that triggers interconversion between the "low" and "high" modes is methionine concentration. Under a certain set of parameters both modes may coexist. This behavior results from the kinetic properties of (i) the two isoenzymes of AdoMet synthetase, MATI and MATIII, that catalyse AdoMet production; one is inhibited by AdoMet, whereas the other is activated by it, and (ii) glycine-N-methyltransferase that displays highly cooperative kinetics that is different from that of other AdoMet-dependent methyltransferases. Thus, the model provides an explanation for how different cellular needs are met by regulation of this pathway. The model also correctly identifies a critical role for glycine N-methyltransferase in depleting excess methionine in the high mode, thus avoiding the toxicity associated with elevated levels of this essential amino acid. 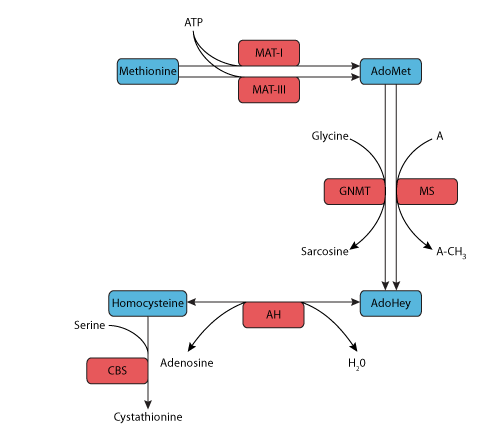 Simplified pathway of methionine metabolism in liver cells employed for modelling in the study described here. The main metabolites are shown in blue boxes and the enzymes in red boxes. Derived from workspace Martinov, Vitvitsky, Mosharov, Banerjee, Ataullakhanov, 2000 at changeset 95827bc44e06.